The commencement of winter season requires a change in school uniform, so it is compulsory for all the students to wear the winter uniform from 15thNovember,2018. Shirts: White Terry cot full sleeves shirts (Arvind Mills) with tie collar and school label for both boys and girls. Trousers: Grey trousers for boys from 1st to 12th and girls from 1st to 5th. Skirts: Grey skirts for girls from 6th to 12th. Blazer: Bottle green blazer for both boys and girls with brass buttons and school monogram. Cardigan: Bright green with three white stripes on neck, sleeves and the waist it will also have the school name on it. Tie: As per prescribed design. Belt: Bottle green with yellow stripes and white buckle with school monogram. Socks: Grey woolen socks with green stripes as per the design approved by the school. Shoes: (Both boys and girls) black shoes with Velcro on Monday, Tuesday, Thursday and Friday. White shoes with Velcro on Wednesday and on working Saturdays. The uniform seller will be available in the school premises from 30th November 2018 Monday, Wednesday and Thursday from 10:30am to 1:30pm. 1. All students are required to attend the school in full uniform regularly. Spruced up appearance makes one look bright and elegant. Uniform should be of a good fit, not oversized. 2. The pattern/uniform approved by the school authorities must be strictly adhered to, otherwise the uniform will have to be replaced. Bhatnagar International School ,Vasant Kunj, primary wing celebrated 150th birth anniversary of the father of our nation- Mahatma Gandhi from 15th to 19th September 2018. 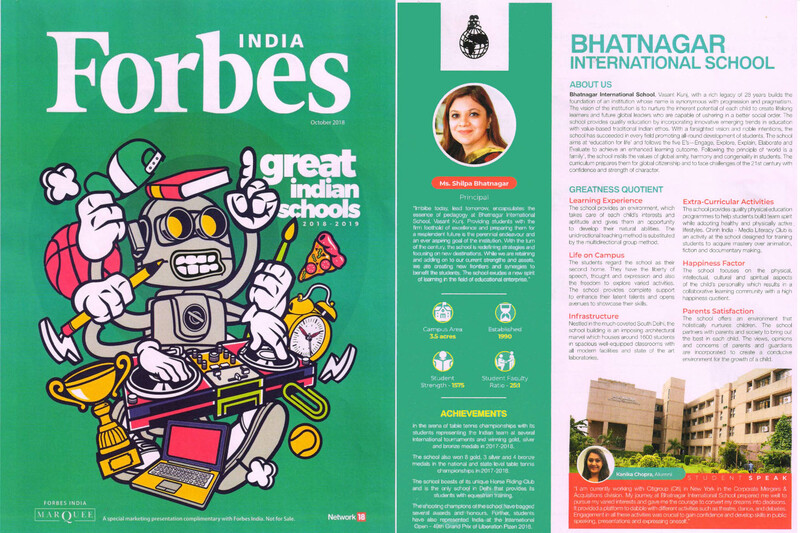 To add to its glory, various events were held in the school premises wherein the students participated enthusiastically in inter –Class competitions. The programme commenced with the tiny tots dancing on some foot-tapping numbers followed by Grade II singing our national song-Vande Matram. On this auspicious occasion, Grade III skillfully drew in the art competition on the theme- ‘Healthy and Fit India’/ ‘Peace and Harmony’. The students expressed their vision for their nation on the above themes explicitly and were awarded with the Certificates of Appreciation for their best artwork. The students of Grade IV set the stage on fire, with their scintillating inter-class dance competition on patriotic songs. To name a few, Maa tujhe salaam, Vande matram, Namaste India, India Waale, etc. The students of Grade V, gracefully presented their skits, as a part of inter-class competition on the various themes based on Gandhian movements throwing light on values of truth, peace, non-violence and sanitation. During the stage performance students threw light on the teachings of Mahatma Gandhi, which inspired all students to follow his footprints. 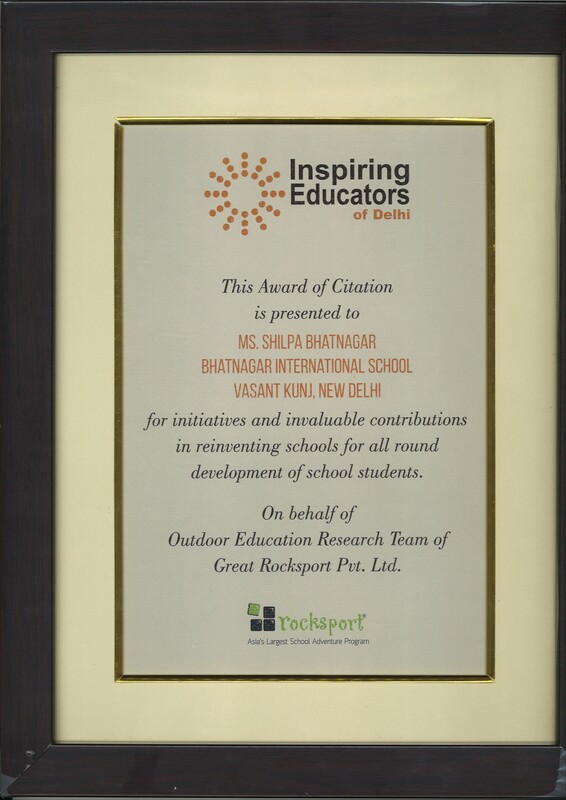 To appreciate the efforts of both the students and teachers collectively, they were awarded with the Certificates of Excellence to make the event a grand success. The event was celebrated with a great zeal, enthusiasm and patriotism. The School will remain closed tomorrow : 17 Aug 2018 due to the sad demise of our former Prime Minister Shri Atal Bihari Vajpayee Ji .As a mark of respect for the departed soul State holiday has been declared. 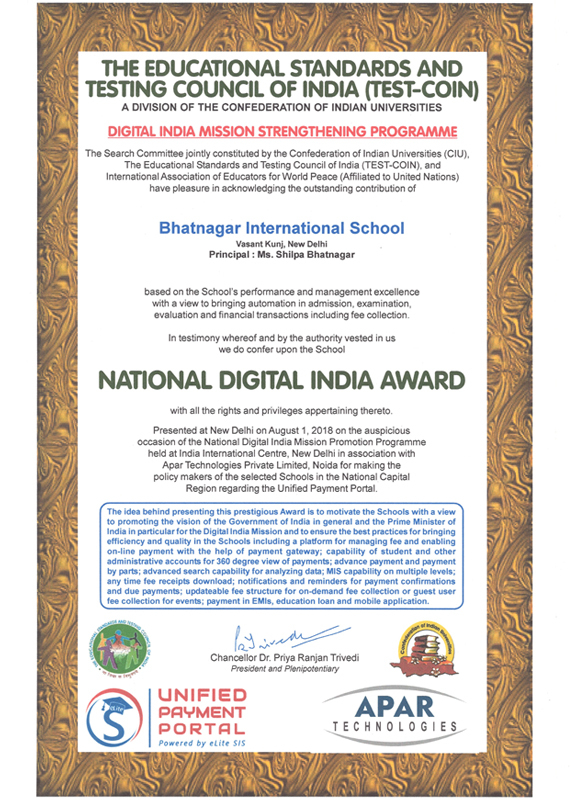 Honourable Principal Ms Shilpa Bhatnagar received the ‘National Digital India Award’ (2018) on 1st August for her outstanding contribution in facilitating the automation of school procedures . Heartiest Congratulations!